Venkata Mulumoodi I want to take this opportunity to thank you mam for introducing me to yoga. You have been an inspiration for me. Honestly, your training has changed the way I see things. It has helped me to face challenges in my professional and personal life. Your coaching style, chants, inspirational quotes, occasional spiritual conversations and your willingness to help us, has given a new perspective to yoga. Kartikeyan Sadras I am very happy and grateful to you for introducing me to yoga and its immense potential. You have been a great inspiration to all of us. Its a great honour to be your student and I hope that you will continue to teach and inspire more people around. Wishing you best of life and health! Chandana Krishnan Geeta mam, you have always been the source of inspiration. I consider you as an amazing teacher and a wonderful person. I always felt very positive whenever I attended your classes. I admire the way you motivate us and make us do the difficult asanas. It is easy to join a yoga class, but I truly believe that it is You, who made us feel the positive vibes of yoga. Thanks for being a wonderful teacher. I seriously feel you are next to my mom. Luv u madam. Subashini Venkatasubramanian I have attended yoga classes before, but none of them can ever match your energy and high impact of your classes. Your motivation and positive words charge tons of energy and confidence in all of us. Your classes were a perfect combination of affection and motivational talks that boost our adreneline. I truly feel you are a priceless gift to mankind. I love every bit of your classes and will miss them beyond words. My prayers for your peaceful and happy long life! Renuka Satish Thank you for being a great teacher and the thought provoking insights that you have shared in your classes. For me, it has been a very inspiring journey since 2008, when I started yoga classes with you. It has given me deep awareness and improved my appreciation of everything. I truly felt the power of yoga and attribute being without any major aches or pain despite long hours of driving each day. Thank you once again! Saraswathi Prashanth Geeta maa, you are my dearest yoga guru. I am able to study, work, multitask and also stay healthy, because of the lessons I learnt from your invaluable teaching. May God bless you with good health and happiness. Kanchana Shivkumar Thank you so much for your guidance and support mam. Yoga have helped me overcome anxiety and back pain. I will miss you and your classes mam. Your enthusiasm and energy is so infectious that I always felt relaxed and positive, when I walked out of your class. I truly appreciate your valuable lessons. Please stay in touch mam. Take care mam. Radhika Murali You have made a positive difference in my life and I am very happy to have met you. Will remember your inspirational talks and they have motivated us to continue out practice despite out busy routine. Thanks for everything. Will stay in touch. Thejobala Sethuraman My introduction to yoga with you was an excellent start of my journey towards good health. Will miss you a lot mam!! Will surely keep in touch. Take care mam. I joined Geeta mam’s prenatal yoga class when I was 3 months pregnant. The long duration pranayama helped me stay calm and positive. In just 2 weeks, I noticed considerable changes; improved energy and enough strength to do my routine work. Geeta mam has an inspiring and positive personality, with an infectious energy, that motivated me to attend each class with passion. Mam not just provides yoga lessons, but also gives important tips on healthy diet and lifestyle. I followed all her advice and got the desired results. Post nine months, I had a short labor about 4 hours, had a normal delivery and of course my baby was healthy. Thanks Geeta mam for the smooth pregnancy and easy delivery. I would highly recommend Geeta mam’s prenatal yoga classes. My quest for a pregnancy yoga led me to Geeta ma’s classes. It was the start of a beautiful association. Geeta ma guided me with utmost love and affection, through a very healthy and happy pregnancy. Each class was special with smile, chanting; asanas were personalized and critical information on health and diet was given. Needless to mention, I had a short comfortable labour and effortless normal delivery. I owe my thanks to my good friend and guru Geeta ma! I started classes with Geeta ma in December 2015, with very basic rudimentary knowledge of asanas. I had severe ankle pain when I joined and I had a very healthy dose of scepticism whether yoga can help me. In a year Geeta ma, not only transformed my attitude and made me an enthusiast but has also addressed my pain issues. I was able to climb Tirupathi hills not once, but two times in 8 months. If it were not for asanas and pranayama I couldn’t have done it. Thank you Geeta ma for your positivity and encouragement. It is truly a pleasure to be part of your classes. I have had the good fortune to have Geeta ma as my yoga teacher. Geeta ma’s enthusiasm for yoga and her zeal towards life is infectious. It is because of yoga and Geeta ma’s dedicated, conscientious, centered, intelligent and compassionate ways has transformed me both physically and mentally. I really appreciate the personal touch with which Geeta ma looks at each of her student. Her everlasting smile and affection on all the students like her own children by listening to their problems, health issues patiently and resolving it. Ma is a right word for her than Ma'am. This is what makes her classes different and inspiring in more than one ways. Like Mata & Guru, her motivational talks has changed the lives of many people in a positive way. My stressful life has become easier after joining her yoga classes. Her therapeutic yoga classes has healed my daughter’s health issues and she is happily married now. I owe it all to Geeta Ma. There are many many people benefited from her classes. I am ever grateful to her and wish to continue as her student. Thank you ma, for being a great source of inspiration. Sri Gurubhyo Namaha. Your ever loving student. Yoga practice was introduced to me by Geetha Ma. I met her and started going to her class after my spine surgeon in USA recommended a surgery for my lower back issue. First thing I found striking was her compassion towards students and their well-being. You will never be able to explain your pain to her without seeing tears in her eyes. She taught me with lot of patience. That was the time I could not even sit down or standup without pain. She got involved and consistently inquired and advised on diet, sleeping pattern, habits etc., Today my back pain is completely cured. She has brought me to a place that I can do head stand everyday with very little effort. All this happened within 18 months. Please mind, during that 18 months I was out of country half the time and not practicing. I think what you learn through Geetha Ma's experience and teaching is a complete package of physical and mental health. This goes with her insight into daily diets and dosage of happiness she spreads through her smile. I am in a journey which started about 2 years before. I am enjoying every bit of it. I wish more people are fortunate enough to learn and practice yoga under caring and capable Guru like Geetha Ma. I am an ardent student of Geeta Yoga for several years. Geetaji is very knowledgeable, and her classes are very refreshing and energizing. In my case, she was able to relieve my eye and shoulder strain by teaching me postures such as head stand and shoulder stand. What's different about Geetaji's teaching, is that she tailors each pose to accommodate an individual's physical limitations and builds confidence in one's physical and mental ability. In addition, she gave me tips to lead a healthy lifestyle. This included incorporating yogic diet, and simple "at work" exercises to ease stress and work-related injuries. I am extremely grateful for the knowledge Geetaji has imparted on me. She has truly changed the way I live and conduct my life. It would be my honour to recommend Geetaji's program to any institution or organization looking to implement a Yoga program and to individuals who are looking to address and heal their ailments. I was introduced to Ms.Geeta Iyer as a Yoga instructor in May 2006. It happened when my wife attended Ms.Iyer’s prenatal yoga classes to help her with the delivery. I was very impressed with the benefits that my wife obtained. I decided to attend her classes as time went along. Ms.Geeta Iyer’s classes are conducted in a professional manner. The atmosphere is great and her pleasant manners go a long way in making the routine so relaxed. Watching her over a period I had observed that she is so tuned to each of the students requirements. During each of the postures she would talk about the benefits in terms of body flexibility and also the metabolic influences that help the person as a whole. Her voice is so soothing that it transcends you into another world. This goes a long way in meditation. The classes definitely helped my health. I play a lot of games and my age made me more prone to injuries. This would put me out of action for a long time. The yoga sessions improved my muscle tone that reduced the incidence of injuries and the recovery time. The flexibility gained improved my skills. All these benefits also helped me during my long hours at surgery both with the posture and the concentration power. My friends and I all agreed that Geeta’s yoga class was the best part of our visit to Chennai. We felt very comfortable with you and in your studio. The poses you took us through were targeted at our needs based on the questions you asked about our life stages - we appreciated that focus. The narrative you provided for each pose was very valuable; we each learned a new pose that we agreed we’d add to our home practice. And, finally, we had fun and came together closer as friends through our yoga practice. Thank you very much for the opportunity. Each of us hopes to see you and attend more of your classes on our future visits to Chennai. I have been practicing yoga with Geeta mam for few years. I note that yoga has changed my attitude towards life and improved the quality of my life. I have become more calm, peaceful, balanced, stress free and tension free. I am able to find quick solutions for the issues that come up. Geeta mam’s is a good teacher and her classes provide valuable information. During my time in Chennai, as President of Ford India Ltd., I was a yoga student of Ms.Geeta Iyer. Although I was only a beginner student, Ms.Iyer taught me with great patience and ensured I knew how to properly execute it. Her sessions were informative, therapeutic and because of her care, never once did I suffer pain or injury. Ms.Iyer’s thorough and empathetic approach is well appreciated by her students. Her enthusiasm for the science and benefits of yoga is infectious. I strongly recommend Ms.Iyer’s instruction to anyone wishing to learn yoga and to do so with a teacher who is patient, eminently knowledgeable and represents the best of her profession. I thoroughly enjoyed my yoga classes with Geeta in Chennai while I was there recently. I attended five classes and I enjoyed every session. Geeta is a knowledgeable teacher who gave me a great understanding and insight of yoga. Her book is fantastic and certainly is illuminating my life. It was wonderful meeting Geeta and her pupils. These yoga classes added to my incredible experience in India. If ever I travel to Chennai again I will definitely look forward to contacting Geeta. I have attended Geeta mam's classes regularly and she is my Yoga Guru for three years. She understands every individual's abilities and ensures that each one benefits according to their personal needs. Every class is a combination of pranayama and asanas. She always says that to derive the actual benefits of any asana, it is important that we do it slowly with mental involvement and rhythmic synchronization of the breath. She is more concerned about the health benefits of every student and insists on giving importance to the food we eat. I am writing this, after completing 8 classes of yoga under Geeta madam’s guidance and teaching. I must confess that this has been the most comprehensive experience for me amongst the different similar programs that I have attended over many years. The classes are taught with a good mix of breathing (pranayama) and asana practice. The reference to the different parts of the body, benifitted thro a particular asana also makes one understand and enjoy while doing the same. While the individuals are allowed to do these practices at their own capable levels, the demos and persuasion motivates one to try more. The groups being smaller, helps in getting personal attention and timely corrections that enables individual to improve the performance. The small changes in the sequencing of the daily schedule avoids monotony and makes us learn much more. Summing up, I would say that I am quite enjoying the classes and would like to continue for some time to come. I would also recommend the program to like minded people whom I come across. What started off as a trial became a reality… when I joined Geeta ma’s class. I attended her classes 6 days in a week. In few weeks of yoga, I have changed in many respects. I get up at 5.30 am everyday and I owe this incredible change to Geeta ma. 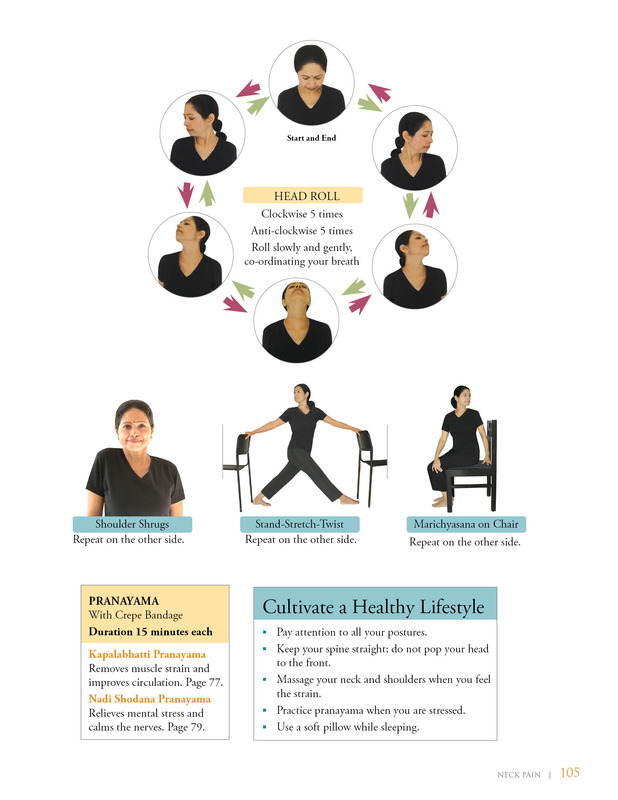 In Geeta ma’s class, you learn how to do asanas correctly,and also their therapeutic benefits. She has the patience to make you practice correctly, and she always appreciates and encourages when you put your full effort in your practice. I enrolled in Geeta ma'm's yoga classes in December 2011 and it is over three years and I am still attending her classes with enthusiasm. I am a two time cancer survivor, and when I joined I had the second surgery just few months ago. To be very frank, I was slightly skeptical when I joined. While I may have given up, she did not, and would suggest/coax/guide me to do few key asanas and breathing. She assessed my limitations and patiently made me do simple movements using props. With Geeta ma'am's, motivation, persuasion and guidance, within few classes I became confident and was inclined to continue. Though I struggled for a year, I found lots of improvements in my health. It is not easy to express in words what yoga and Geeta ma'am classes have meant to me. Geeta ma'am would carefully change sequences, simplify them if needed, and work closely with me in every session. Now after several years of practice, I have come a long way. I remember, I could not hold my hand above my head for even few seconds, could not sit on the floor for even five minutes and simple breathing was very difficult. Now, after three years I am confidently doing pranayama for nearly 20 minutes, shoulderstand, plough and head stand without difficulty. I am keen to continue yoga, learn more asanas and improve my health and immunity. Geeta ma'am is a very knowledgeable, dedicated, committed, and involved teacher with many years of teaching experience. She is a terrific teacher and I am really very lucky to find her! Thanks ma'am! Geeta Ma’s classes are truly lessons for right living and I never like to miss her classes. I have not only learnt how sacred our physical self is, but also understood the importance of mental well being. My overall health has improved. The lessons at the end of each session and the inspiring talks have made me a much calmer and a positive person. I have been attending Geeta mams class for the past 10 months, on weekends. Every class is very rejuvenating and has helped me come out of my postpartum depression very quickly. She has a unique personal touch with every student who attends her classes and works along with them to overcome their problems. I feel totally refreshed and relaxed after every class. My daughter attends her ‘children's yoga’ classes and she simply loves it. Once when Geeta Mam went out of station, she felt so bad and missed the classes. I have great satisfaction learning yoga, from a very good mentor. I am attending Geeta’s classes five times in a week for over ten years. I remember when I joined her classes I was so stiff that I could not do many asanas. These classes are scientific, inspiring and really healing. Geeta monitors every student keenly and corrects their mistakes. She has a unique ability to understand and create awareness of proper alignment and gives importance to listen to the signals from the body and to practice accordingly. She says that such a practice has more benefits. I thoroughly enjoy her classes. Over the years of repetitive practice I am at last able to do many advanced asanas with much ease. I owe all my learning to Geeta. She has inspired and encouraged me to attempt difficult asanas and properly guided me during the practice. I feel good in Sarvangasana, Supta Virasana and Sirsasana. These are her strengths as a teacher. She insists on 20 /30 minutes of pranayama practice in her classes and this has developed lot of strength in me. I feel very accomplished and happy because I have gained a lot of strength and overcome sinus problem, neck pain, low back pain, migraine headache and many more health issues. I can now walk in the sun and not get migraine!!! Thanks to the practice of Sithali Pranayama. "I thought I had signed up for yoga classes when I started with geeta ma. But I realised that life lessons were also an important part of geeta ma's way of yogic teaching. She adopts a unique way of introducing benefits of yoga for different parts of the body along with chants and life philosophy. In under a month, I have observed my body letting go of rigidity and mind-fear. An affection for pranayama, an enthusiasm for asanas that stretch every part of your body... geeta ma infuses this in her students. This long term journey of yoga that I wish to undertake has become more possible and realistic under the watchful eyes of a guru who guides and educates constantly without excessive strain. Call it divine intervention or just the right time, yoga and my yoga guru have come at an important stage in my life and I hope this calling comes to many." "Geeta mam is a truly gifted teacher. Her talent as a yoga teacher shows through in her thoughtful class sequencing, calming demeanour, and ability to work with many student ability levels. I am just beginning my yoga journey and am so lucky to have Geeta mam as my guru. With her warmth, wit and knowledge, she plants seeds of what's truly important in life. From the first days of having no idea what a sun salutation was to now, she has really helped me grow in my practice - both physically and mentally. Each of her classes are different, but at the end of each one, I feel like I have explored physical and mental territory that I never would have gotten to unless I was in that room for that session. Awareness of one’s inner self and unfolding of your own truths come naturally under Geeta mam’s loving guidance. I always leave her class feeling light, centred and renewed." I attended Geeta maam’s yoga classes or four months,and improved my health in many ways. Initially when I planned to join I thought the classes to be boring but in the first session I realized that my decision was right. In few weeks of practice, my lowback pain vanished, negative thoughts disappeared, I became calm and stress-free. Yoga also helped control my long term problem hyperhydrosis and I am really happy. Geeta ma is a very experienced teacher who takes individual care of all students. She addresses each of their health issues with utmost care. These classes definitely deserve an “excellent” rating. I attended her classes for two years. Geeta Ma’s classes are great for everyone, whether for beginners or for those who have been practicing for many years. She provides personal attention, focuses on improvement of health and helps students to get relief from their pain. She has understood my needs and has made me feel very comfortable; has patiently explained how to adjust and adapt in asanas. I am glad, I met Geeta mam the most joyful person. Please join her classes! It is educative, teaches about the right postures and lifestyle. You`ll have fun and you`ll learn a lot from Geeta Ma`m. Thanks Ma`m, you are awesome!! Yoga has become an integral part of my life. It has helped me to start a fascinating discovery of my inner self. Before starting Yoga, I had health problems like fatigue, low back pain, stiff shoulders, and high blood pressure. Yoga has helped me to overcome all these problems and has made me healthy and more confident. Thanks to Geeta ma for introducing me to this fascinating world. I have been her student for over eight years. The passion with which she teaches is contagious and the sincerity with which she urges her students to practise them motivates the students strongly. Her experience as a teacher helps her to rightly understand and analyse her students physical condition and suitably guides them to stretch up to their individual capacity – this is her speciality. Her style of explaining the benefits while doing each asana draw the student’s attention and enable them to understand their strengths and weakness. Geeta ma‘s teaching goes beyond the practice of asanas & pranayama, the chanting of mantras and the constant guidance in every session, about healthy lifestyle helps us to change and develop our overall personality.